[177 Pages Report] The multi domain controller market is estimated to be USD 1.3 billion in 2018 and is projected to reach USD 20.2 billion by 2030, at a CAGR of 25.7% during the forecast period. The increasing focus on R&D activities and rapid technological changes owing to the changing government norms for vehicle safety are projected to drive the market. The 128-bit segment is expected to be the fastest growing multi domain controller market, by bit size, during the forecast period. The 128-bit segment will grow at the highest rate as the industry moves toward the new priority of manufacturing self-driving cars and environment-friendly vehicles. The 128-bit MDCs have the highest bit rate and are hence the most suitable for ADAS and safety functions as they can respond the quickest. These MDCs will start gaining momentum in the near future (within 5-8 years) due to the increasing adoption of autonomous vehicles. 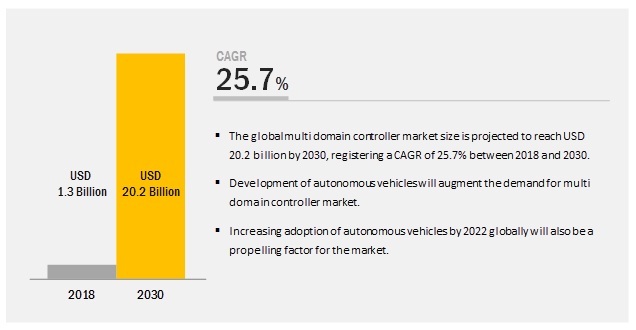 The autonomous vehicle segment is expected to have the highest growth in the multi domain controller market, by level of autonomy, during the forecast period. Autonomous vehicles (L4-High Automation and L5-Full Automation) are those vehicles that do not require any human intervention for their functioning. The demand for such vehicles is expected to increase in the future as extensive R&D activities, and multiple strategic partnerships in the automotive industry have led to innovative developments that make them more reliable and sustainable. The demand for automotive Multi Domain Controllers (MDCs) is also expected to rise in proportion to the production of fully autonomous vehicles due to their obvious advantages over ECUs such as centralized topologies and high bandwidth, which helps in simultaneously controlling all the functions in the vehicle. Asia Pacific is expected to be the largest region in the multi domain controller market during the forecast period. Asia Pacific comprises emerging economies, such as China and India, along with developed nations, such as Japan, and is the largest market for automobiles. In recent years, the region has emerged as a hub for automobile production. Infrastructural developments and industrialization in the emerging economies have opened new avenues, creating several opportunities for the automotive OEMs. To gain a competitive advantage in the market, OEMs are offering advanced applications such as HMI, keyless entry, and auto-park assist among others, which naturally increases the number of ECUs in vehicles. This, in turn, is expected to drive the growth of the market in the region. Moreover, the different governments in the region are set to introduce stringent environmental regulations, for OEMs from 2020, compelling manufacturers to reduce vehicle weight. All these factors are expected to fuel the growth of the market in the region. The key players in the multi domain controller market are Continental AG (Germany), Visteon Corporation (US), Robert Bosch GmbH (Germany), Aptiv (Ireland), Panasonic Corporation (Japan), ZF Friedrichshafen AG (Germany), Faurecia (France), Magna International Inc. (Canada), Lear Corporation (US), Autoliv Inc. (Sweden). Continental is anticipated to be a dominant player in the market. Continental adopted the strategies of new product development, expansion, supply contracts and merger & acquisition to retain its leading position in the market. Strengthening the product portfolio and global presence by building customer relationships, Continental has left a mark not only in the current market but also in emerging markets such as India. This is the strategy that Continental is following to maintain its leadership in the market. In September 2018, Continental developed an environment model that captures vehicle environment using various sensors. The data from sensors such as camera, radar and [laser-based], and LIDAR are combined with additional information such as the profile of the route ahead which is collected, evaluated, and interpreted by an intelligent control unit—Assisted and Automated Driving Control Unit (ADCU). In October 2018, Faurecia announced the acquisition of Parrot Faurecia Automotive. The deal followed the announcement of an agreement between Parrot and Faurecia on July 5, 2018, regarding Faurecia's proposal to acquire 100% stake in Parrot Faurecia Automotive. The transaction is based on an enterprise value of USD 114.6 million (EUR 100 million). In August 2018, Visteon and ZongMu Technology, a China-based supplier of ADAS, signed a strategic cooperation agreement to develop Level 3-plus autonomous driving solutions. Under the agreement, Visteon and ZongMu will combine their strengths to jointly develop a self-parking solution integrating Visteon’s DriveCore autonomous driving platform and ZongMu’s autonomous parking system. How will the increasing adoption of electric vehicles and changing environmental norms affect the multi domain controller market? What are the technical features that are disrupting the market? What will be the future technological advancements in multi domain controllers? Figure 57 Company Snapshot: Magna International Inc. Figure 59 Company Snapshot: Autoliv Inc. The study involves 4 main activities to estimate the current size of the multi domain controller market. Exhaustive secondary research was done to collect information on the market such as the use of multi domain controllers in various vehicle types and their benefits. The next step was to validate these findings, assumptions, and market analysis with industry experts across value chains through primary research. A top-down approach was employed to estimate the complete market size of different segments considered in this study. Secondary sources referred to for this research study on the multi domain controller market included organizations related to the automobile industry such as OICA; corporate filings such as annual reports, investor presentations, and financial statements; and trade, business, and automotive associations. The secondary data was collected and analyzed to arrive at the overall size of the market, which was further validated through primary research. Extensive primary research was conducted after acquiring an understanding of the scenario of the multi domain controller market through secondary research. Several primary interviews were conducted with the market experts from both demand- side (OEM side) and supply-side (Tier 1, Tier 2, and Tier 3) across 4 major regions, namely, North America, Europe, Asia Pacific, and the Rest of the World (RoW). Primary data was collected through questionnaires, emails, and telephonic interviews. In our canvassing of primaries, we strived to cover various departments within organizations, which included sales, operations, and administration, to provide a holistic viewpoint of the multi domain controller market in our report. A top-down approach has been used to estimate and forecast the size of the multi domain controller market. The global market size of the multi domain controller market from supply-side has been derived by considering the revenue generated by all the industry players providing multi domain controllers for automotive, year-on-year (Y-O-Y) growth of the multi domain controller industry. 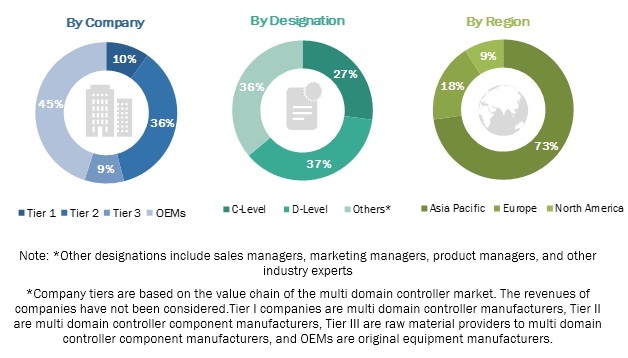 The market size of multi domain controllers from demand-side has been derived by multiplying the global multi domain controller market with the penetration of the automotive industry applications based industry use cases, company developments, and primary insights. The market size and approach was further discussed with primary participants for correction and validation. Based on the primary insights and industry growth, we developed 3 scenarios (Optimistic, Pessimistic, and Most Likely) and the most validated scenario “Most Likely” has been considered to arrive at final market estimates. The global multi domain controller market is further segmented into regions by considering factors such as the regional development and R&D centers, the market size of the automotive industry (production), customer preference, increasing complexity in vehicle architecture, level of autonomy in vehicles, and primary insights. Further, the regional multi domain controller market, by country, has been derived by determining the penetration of multi domain controller in various vehicles (passenger cars, light commercial vehicles, and heavy commercial vehicles) for various countries through model mapping. All percentage shares, splits, and breakdowns have been determined using secondary sources and verified by primary sources. All parameters that are said to affect the markets covered in this research study have been accounted for, viewed in extensive detail, and analyzed to obtain the final quantitative and qualitative data. This data has been consolidated, enhanced with detailed inputs and analysis from MarketsandMarkets, and presented in the report. The data was triangulated by studying various factors and trends from both, the demand and supply sides, in the multi domain controller market. This research report categorizes the multi domain controller market on the basis of vehicle type, propulsion type, bus systems, bit size, level of autonomy, application, and region.